Toys Logic is definitely getting my business with such a hot price like that! Toys Logic has fucked up pricing on everything. Half their stuff is underpriced, and the rest is overpriced. $88 WTF?! Looks like somebody's gonna have a lot of Blues figures and not enough orders. And this is why I stopped buying from ToysLogic as soon as I found AmiAmi. I pre-ordered these some time ago from Amiami. 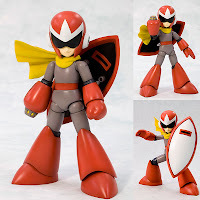 Also ordered the Rockman and Roll figures from them. Good experience so far. No problems with AmiAmi and very well packaged too. Quick emails from customer support (had to change my address) and no hassle. I was a little afraid of them with their price being so cheap, but I was pleased.